the first time a YA novel has won this award in the 60 years of the competition. One of my favourite parts of being an author is getting to meet my readers. I enjoy going in to schools to run book sessions or workshops all based around game playing or coming down the front to put on costumes or take part in quizzes. find out about monster mash-ups! or join the Secret Society for the Protection of Mythical Creatures. As Joss Stirling I offer an event for teens around using playlists and music for inspiration. As Eve Edwards, I am currently offering an event for teens on the centenary of World War I as well as more generally about writing historical fiction. I am also experienced in conducting writing workshops for both children and adult classes. My charges are set at Society of Author recommended rates either for a whole or half day. Please contact me for current details. I have written over fifty novels for children and teens under my three names, Julia Golding, Joss Stirling and Eve Edwards. I also write for adults, adapt novels for theatre and write screenplays. Enter a fantasy island where Phil the dodo and other unusual wild animals roam corridors, great halls and an underground network of passages of a magnificent museum and science academy. Prevented from following her creative passion as a stonemason, Ree is confined to cleaning the halls at night as a maid. 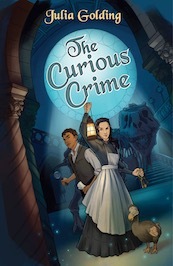 But then the murders start happening... A determined scholar Henri and strong-willed Ree join forces to solve the mysteries and prove their innocence.